Perioperative management of patients receiving opioid addiction therapy presents a unique challenge for the anesthesiologist. The goal of pain management in this patient population is to effectively manage postoperative pain, to improve patient satisfaction and outcomes, and to reduce the cost of health care. Multimodal analgesics, including nonsteroid anti-inflammatory drugs, intravenous acetaminophen, gabapentanoid agents, and low-dose ketamine infusions, have been used to improve postoperative pain and to reduce postoperative opioid use. Patients on long-term opioid management therapy with methadone and buprenorphine require special considerations. Recommendations and options for treating postoperative pain in patients on methadone and buprenorphine are outlined below. Other postoperative pain management options include patient-controlled analgesia, intravenous, and transdermal, in addition to neuraxial and regional anesthesia techniques. Special patient populations include the parturient on long-term opioid therapy. Recommendations for use of opioids in these patients during labor and delivery and in the postpartum period are discussed. Sudipta Sen, Sailesh Arulkumar, Elyse M. Cornett, Julie A. Gayle, Ronda R. Flower, Charles J. Fox, and Alan D. Kaye declare that they have no conflict of interest. IASP Taxonomy - IASP. [Online]. 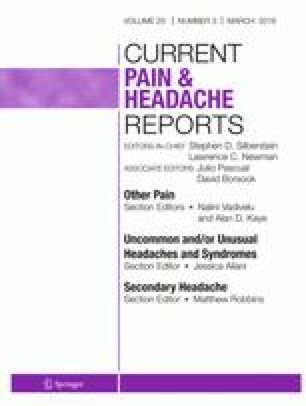 Available: http://www.iasp-pain.org/Taxonomy?&navItemNumber=576. Accessed 14 Dec 2015. Relieving pain in America: a blueprint for transforming prevention, care, education, and Research - Institute of Medicine. [Online]. Available: http://iom.nationalacademies.org/reports/2011/relieving-pain-in-america-a-blueprint-for-transforming-prevention-care-education-research.aspx. Accessed 14 Dec 2015. This is an excellent and comprehensive review of pain and how to treat pain. This review includes pain as a public health concern and the diagnosis and treatment of pain as well as discussion on the variety of new treatments for pain that are available today. Unintentional drug poisoning in the United States. [Online]. Available: http://www.cdc.gov/HomeandRecreationalSafety/pdf/poison-issue-brief.pdf. Accessed 14 Dec 2015. Equianalgesic opioid dosing calculation isn’t simple math. [Online]. Available: http://www.hcplive.com/conference-coverage/painweek-2013/equianalgesic-opioid-dosing-calculation-isnt-simple-math. Accessed 05 Jan 2016.